The most popular martial arts comedy series online with over 60,000 subscribers and 10 million channel views. If the television show “The Office” and the movie “The Karate Kid” had a baby…you’d get “Enter The Dojo”. This mockumentary show that launched on YouTube in August of 2011 has become the most popular martial arts comedy series online with over 60,000 subscribers and 10 million channel views. Click on the image for multiple shots / up close look. 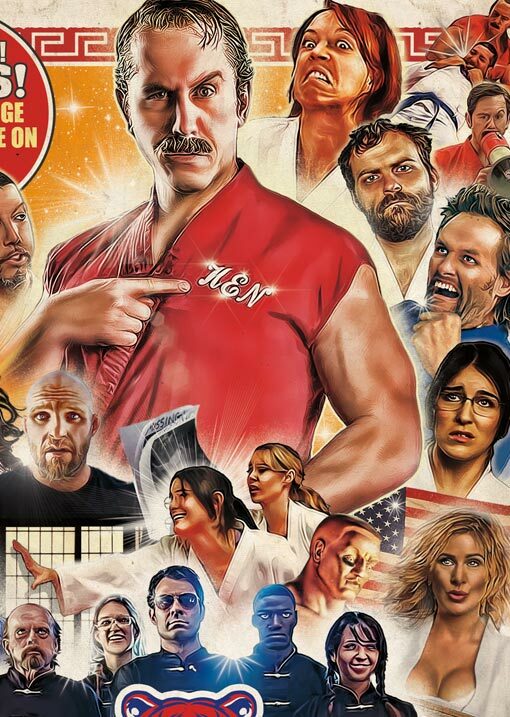 Master Ken (aka: Matt Page) wanted a classic 80’s collage style interpretation of his “Enter The Dojo” Season 1 and 2 DVD Collector Edition artwork. This design choice adds to the light-hearted and nostalgic mood of the series and was great for cast member autographs as well.